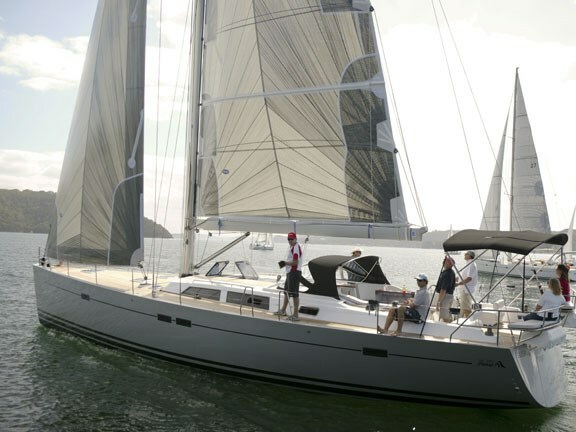 The Hanse 540e is a powerful, short-handed passagemaker, a harbour home afloat and a club racer. 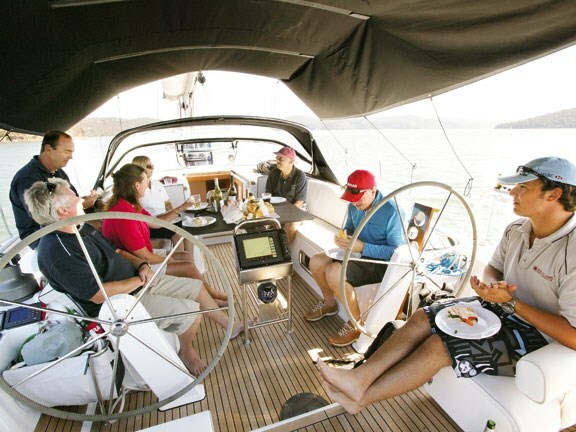 There is ample cruising and entertaining space. It’s one of the easiest large boats we’ve ever sailed, with less rope and gear clutter than any of them. 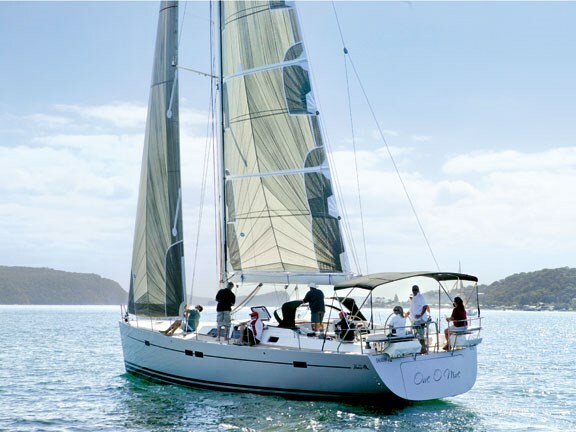 The key component is a high aspect-ratio 9/10 rig, with a self-tacking, furling headsail. Instead of the usual ropefest along sidedecks is a simple, curved sail track across the foredeck and car, to which the jib is sheeted. 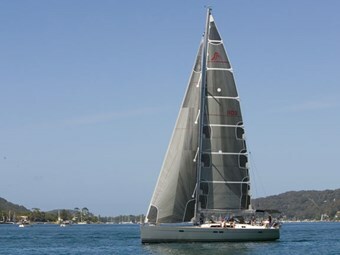 The 540e jib clew has a crow’s foot arrangement to spread sheet loads through the sail and position the foot of the sail as close as possible to the car. The jib sheet is spliced to the car, runs through a clew block, back to the car block and up to a sheave in the mast, just below the first spreader. The sheet runs over the mast sheave, down inside the stick to a deck turning block and aft to a powered sheet/halyard winch. By taking the sheet up the mast the angle into the sheave is narrow, regardless of the car position on the track, so sheet friction and sheave loading are limited. 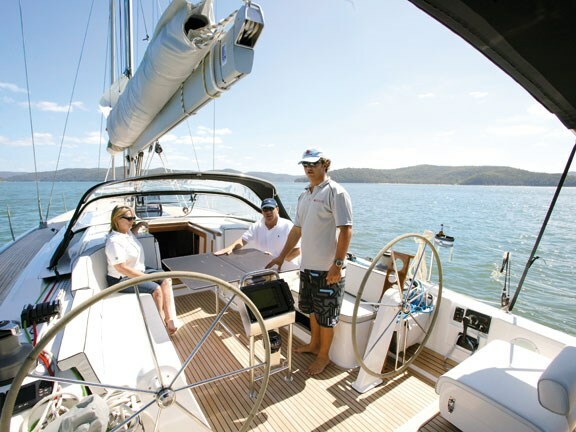 The mainsheet system also contributes to the Hanse ‘clean deck’ philosophy. Triangulated mid-boom sheeting runs forward along the boom to turning blocks and then aft to the winch (optionally powered). Port and starboard halyard and sheet tails drop into purpose-designed, square-mouthed bags in front of each wheel pedestal, so there’s none of the usual rope clutter in the cockpit. 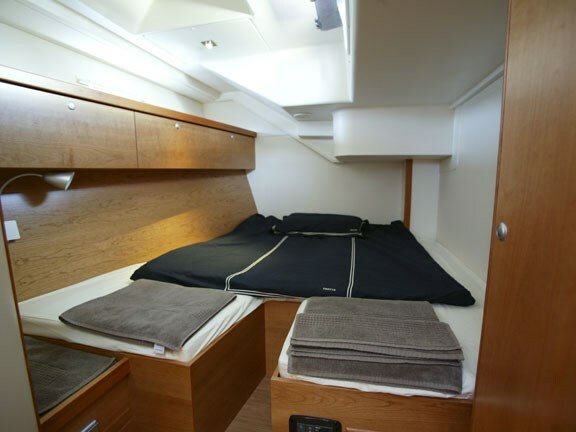 The 540e’s working and relaxing space is in the large powerboat or catamaran class. You could comfortably seat 12 in the 540e’s cockpit and aft seats for day sailing. 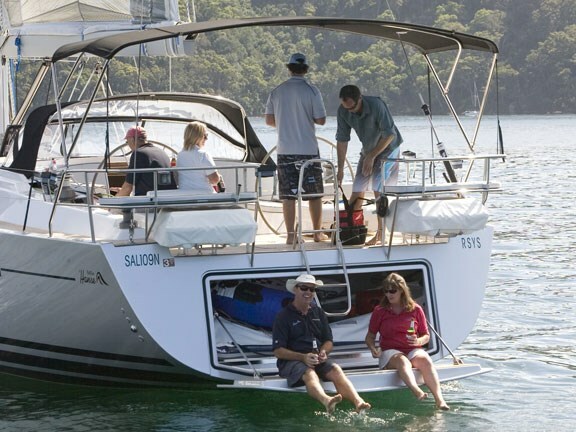 The transom can be an optional garage door, with a teak-faced swim platform on the inside. The garage has ample space for a tender and other water toys. 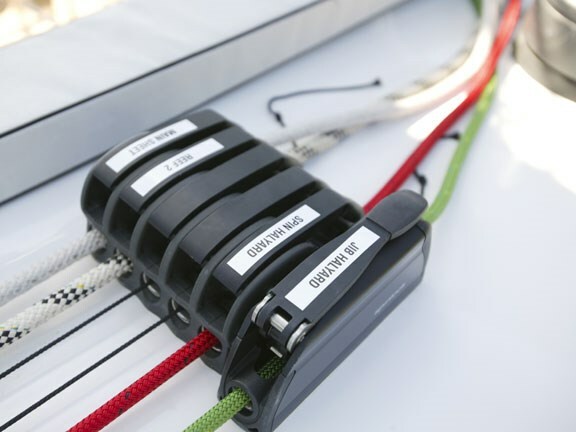 The 54AST primary winches (starboard one powered as standard) are positioned just ahead of the wheels, so steering and sail control can be done at the same time. The 46AST secondaries are located well aft, for optimum gennaker control. On the bow a flush-hatch opens to reveal the unique chain locker; an anchor is mounted on a swinging davit that raises and lowers through 180o with gas strut assistance. When not required, the anchor and davit fold out of sight under the deck. 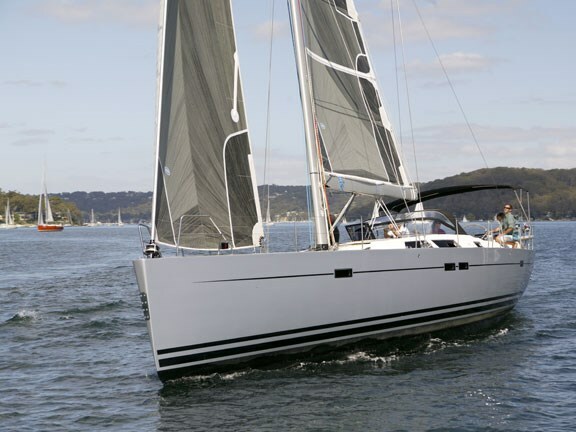 Hanse has an epoxy resin option that’s available on boats from the 370 to the 630 and denoted by the suffix ‘e’ in the model number. Epoxy resin offers lighter weight, greater mechanical strength and improved resistance to impact damage and water ingress. The 540e’s companionway is quite steep and best handled by backing down. The treads are grooved for grip and a pair of teak handholds makes the task quite safe. 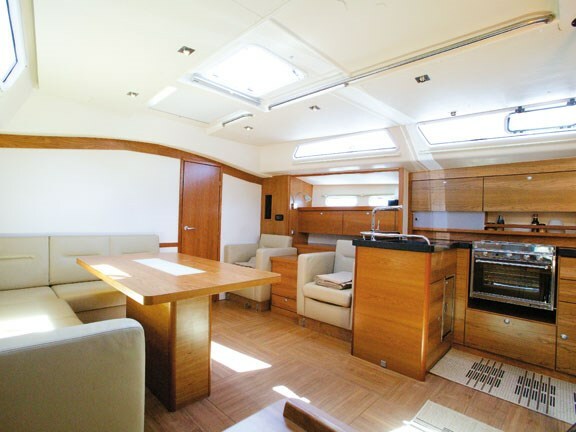 The saloon, galley and navigation station fit into a huge, open-plan area, plenty of headroom. The galley features black quartz tops, a 130lt fridge and 80lt freezer, a three-burner gimballed stove with oven, a microwave, optional wine cooler and stacks of cupboard space. 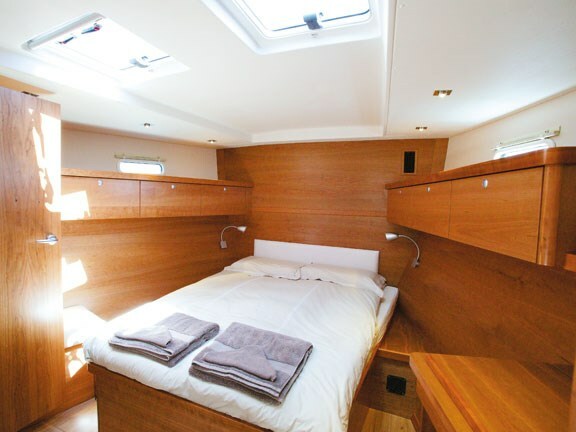 Accommodation in the test boat consisted of a pair of double cabins aft, each with its own head and shower, and a full-beam stateroom with island bed for’ard. All the cabins had ample hanging and stowage space. 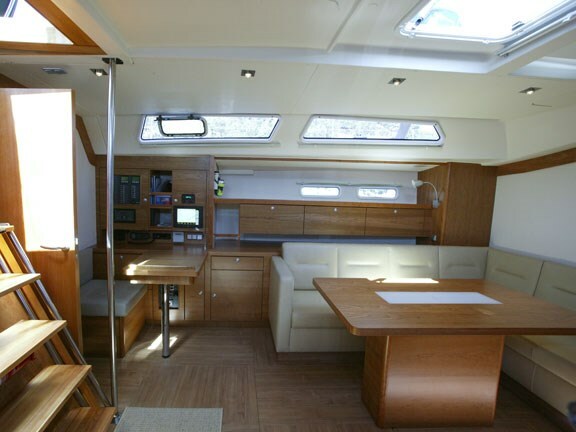 The teak-finished cabin floor was set out like large parquetry panels. Each one is removable for access to tanks, wiring and plumbing: they lift by using a small suction cup. 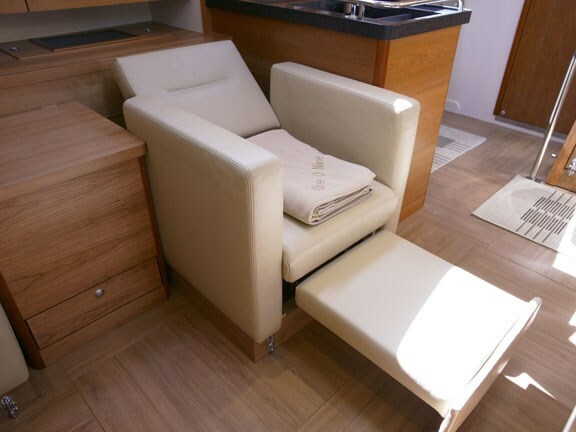 The companionway lifted to provide front access to the engine, with additional side access panels in the aft cabins. The engine sat deep in the boat, allowing space for a genset on top. Engine and genset noise was well muffled above and below deck. The Yanmar pushed us along at a brisk seven knots and was obvious the engine had enough grunt to do better if required. Once clear of the moorings the optional North carbon main went up quickly, courtesy of the powered halyard winch. With the luff tensioned, the main halyard came off the winch and the jib sheet went on to pull out the matching headsail. The sheet was tightened for upwind trim and that was it for the jib. The main trimmed easily on the optional powered port winch. 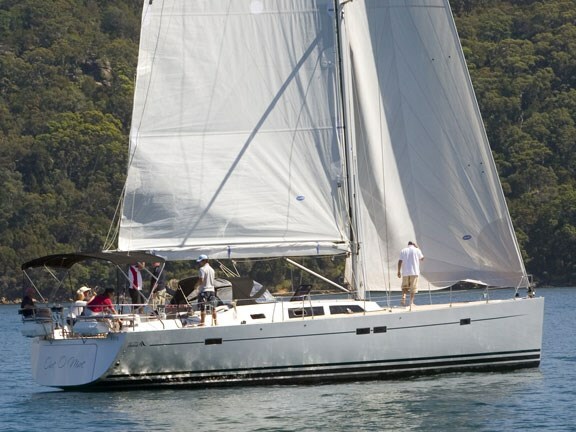 Reefing the big main has been made as easy as possible, with a one-line system that has large blocks at the cringles. I found the helm beautifully light and balanced, with no friction points in its range. In the sub-10-knot breeze it was comfortable to sit to leeward and sight the jib tufts, with only two fingers on the wheel rim. 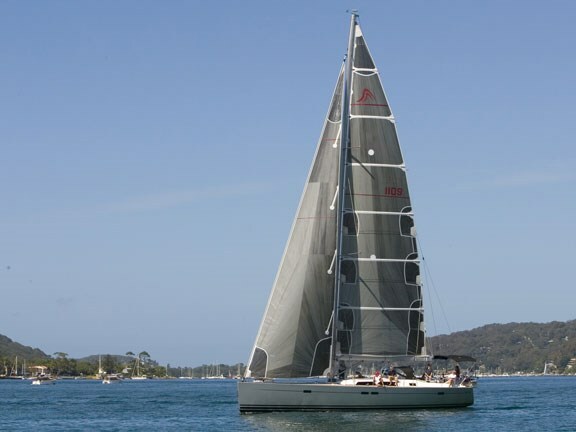 Using the 540e’s 26m mast height, it was easy to steer, and the big Hanse pointed well and made around half wind speed sheeted in hard. Flaking and stowing the big main in its zipper bag was the only tidying-up chore needed. 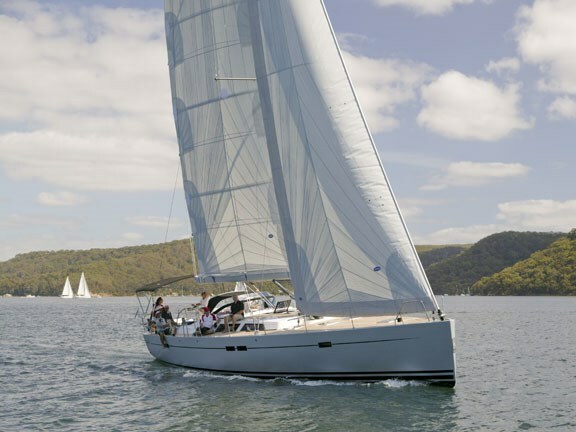 Hanse doesn’t fit furling mains but there must be pressure on the company to provide an option for some cruising couples. 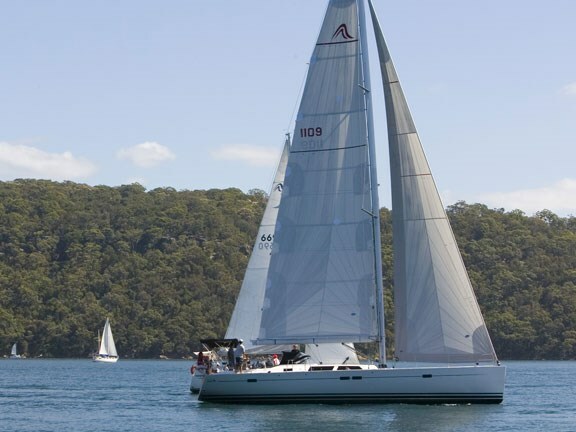 Read more reviews of Hanse boats here.